Hi everyone! 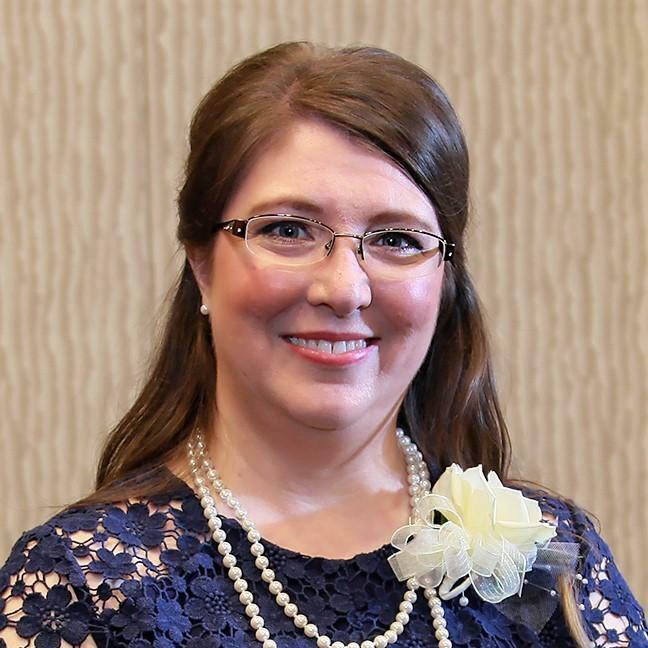 My name is Mandy Watson, and I am your child's librarian at Decker Prairie Elementary. This will be my 14th year of teaching and my 8th year as librarian. I look forward to seeing your child come each week to the library to check out his or her books, to hear me teach a lesson, and to participate in library activities such as read alouds, technology sessions, or library stations/makerspaces. I hope my lessons and stories I read aloud will inspire a love for reading and learning in your child! Look around this site to learn more about our library. If you have any questions, don't hesitate to contact me. 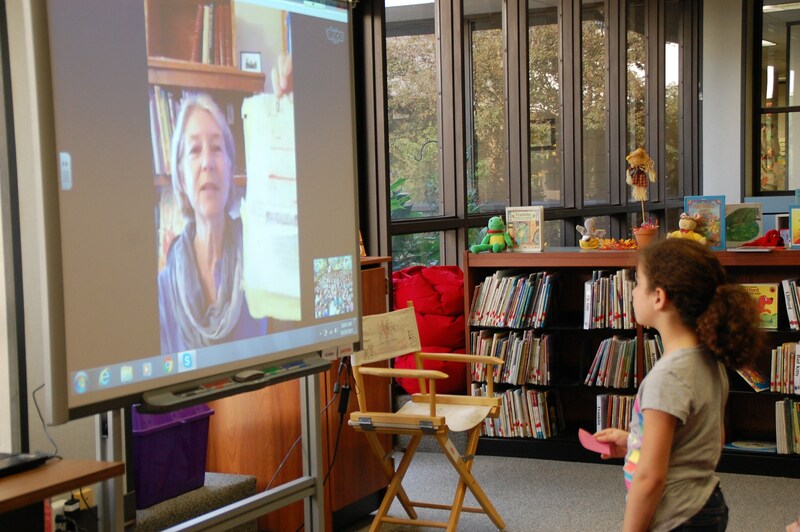 Last week 1st and 2nd grade got a real treat on the National Day of Writing (October 20th): they got to Skype with author Erin Dealey (erindealey.com) who lives in California. Ms. Dealey wrote many great books including Goldie Locks Has Chicken Pox, and Little Bo Peep Can't Get to Sleep, and Deck the Walls. She gave great tips to our students on writing such as a book always starts out as a "sloppy copy," and a few of our students got to ask her questions. This picture shows Madeline asking our author about her writing process, and Ms. Dealey is showing Madeline what her "sloppy copy" looked like. Thank you Ms. Dealey for giving our students this special treat! This week, on October 30th, 3rd and 4th grade will get to Skype with author C. Alexander London and talk about his new book The Wild Ones. We're Going on a Sensory Language Hunt! Two weeks ago, our second graders had to learn what sensory language is. This is a hard concept for them to understand: words that an author uses that helps the reader know what something looks, smells, tastes, sounds, or feels like. I described sensory language using this video and the book We're Going on a Bear Hunt by Michael Rosen. The students enjoyed creating their own sensory language to go along with the story! Your PreK and kindergarteners may have come home saying I turned them into a pizza. It is true, with the help of the book Pete's a Pizza by William Steig, I turned them all into pizzas! 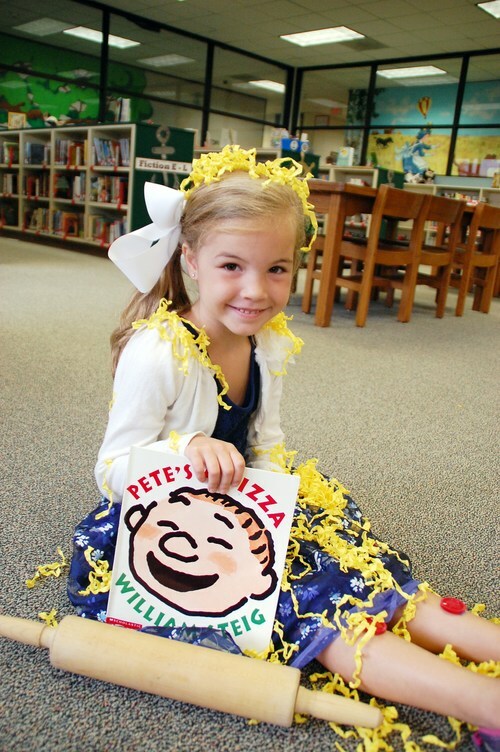 Here is one example of our sweet kindergartener Abigail as a beautiful looking pizza. This week, 3rd and 4th grade learned about the importance of staying safe on the internet. The internet can be a great tool for your child to do schoolwork, play online games, or to do research if it is used properly. 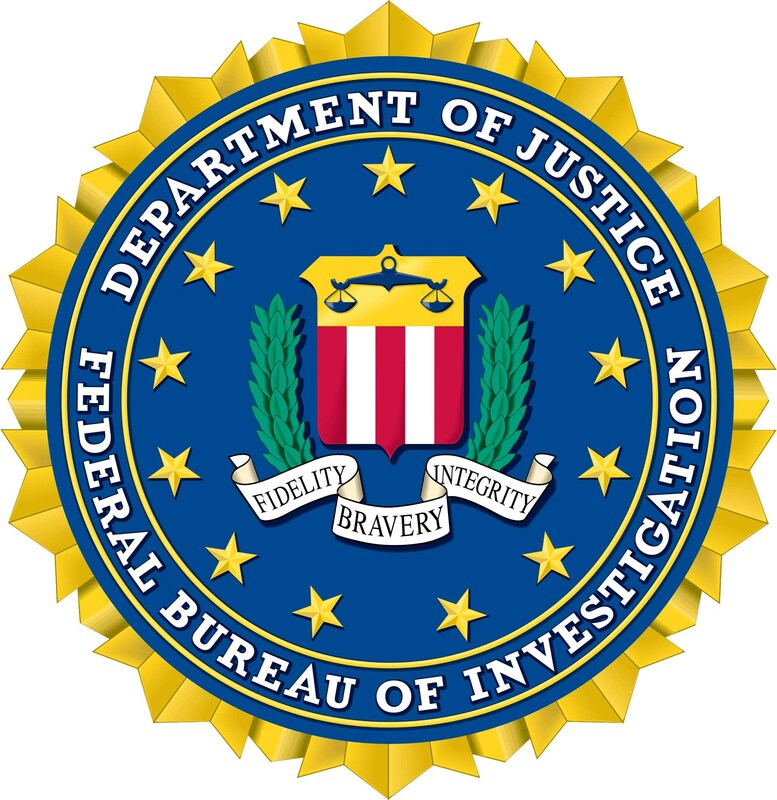 Explore with your child the FBI's Safe Online Search website made for kids in grades 3rd-8th grade. It can be accessed under my "Library Links" page or by clicking here. Mother Goose visited kindergarten this week! The kindergartners really seemed to enjoy her visit. 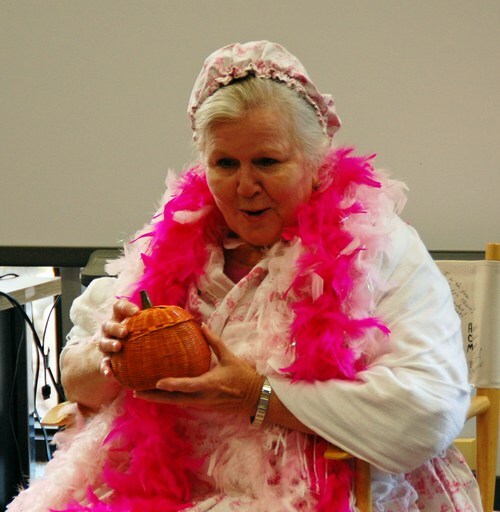 Mother Goose taught our students many of her rhymes that she hopes someday they will tell to their children. Thank you Mother Goose for coming, and thank you kindergarten for being such a good audience! Don't Let the Pigeon Check Out Our Books! Last week our first graders learned that although the Pigeon books by Mo Willems (such as Don't Let the Pigeon Drive the Bus!) are hilarious, Pigeon is not ready to check out a book. Watch the YouTube video that I showed our first graders and discuss with your child why Pigeon is not ready to check out books yet at DPES. Enjoy! You child will be bringing home a bookmark with their library book to share with you what day each week they will come to the library. You can also click on the link "Class Library Visits" to see what day and time your child will come. Once again, I cannot wait to see your child and help instill a love for reading and learning in them!